I can get a system right now with an i5 2500k fully equipped with everything but a dedicated GPU for 350 off a seller. I was wondering what the performance would be of an OCed i5 2500k vs a STOCK 4670k just for reference sake. EDIT: Changed title, now taking a look at the performance between the i5 2500k and its successors. Trying to determine whether the i5 2500k is still a relevant purchase and how it stacks up against the others. Look below for info, and charts. Haswell is about 15-17% faster than Sandy Bridge clock-for-clock + a ~3% clock-speed bump. So SB at ~4GHz is about as fast as Haswell at stock. They're both top tier gaming CPUs. The difference is negligible... That's why most people are still gaming on their 2500k, OCed or not. Heck, even OCed first gen i5s/i7s are still more than sufficient for any sort of gaming. There is a 5-10% performance increase (at same clock speed) in between every generation gap. 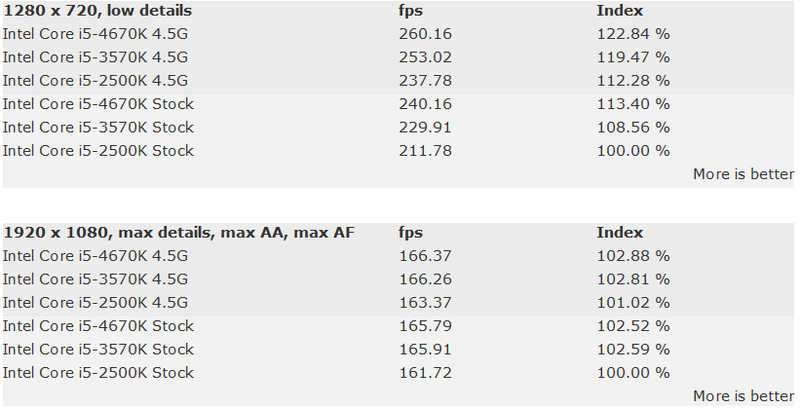 And as you can see in some benchmarks such as Crysis, FC3, Skyrim, Sleeping dogs, and Metro, CPU definitely makes a decent difference. 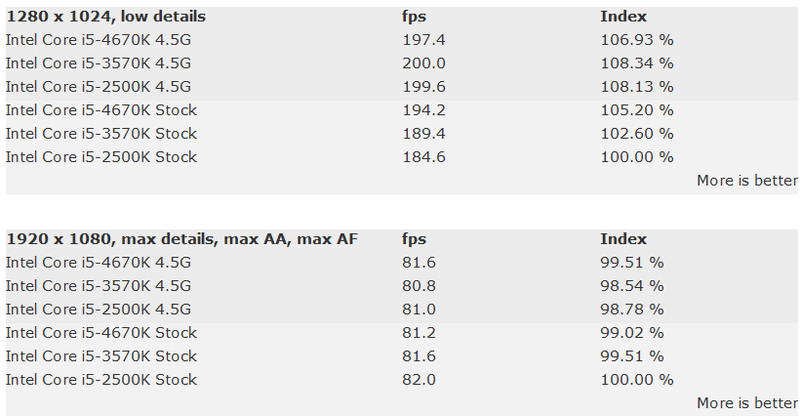 Ok...this looks suspect from other benchmarks. 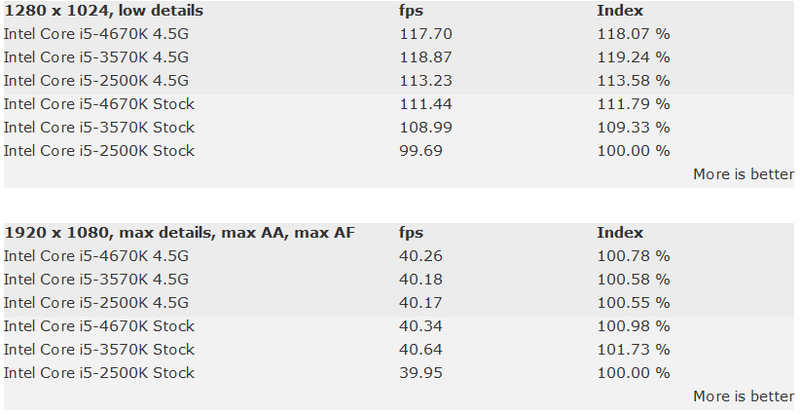 While other benchmarking sites show a difference of 5-10 fps in some cases...this one shows single fps difference in almost every single game they benchmark. Bioshock being one of the only games that show a difference of more than a couple fps. 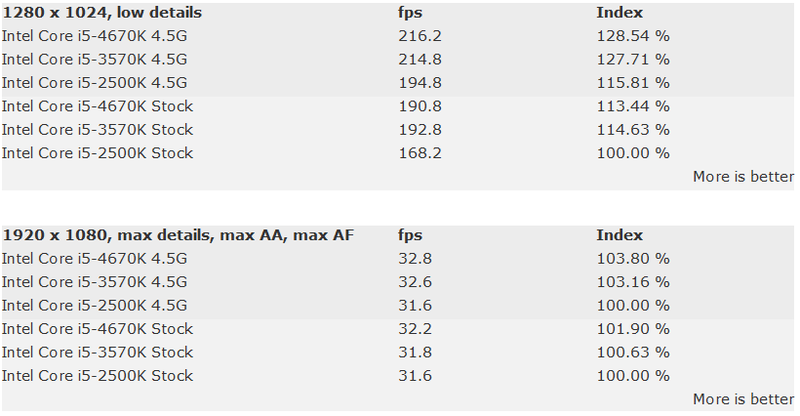 Just for personal experience, I was surprised that my 2600K @ 4.6 was neck-and-neck in Cinebench 15 with a 4770K @ 4.4 Ghz. But with that information, buying the 2500K option would require overclocking, and overclocking would depend on which motherboard is part of the package. How did your 2600k stack up in real world gaming? Also, with this information, it looks like the 2500k doesn't even need overclocking, as its pretty much within a few fps margin. In the case when details are cranked up, you're absolutely right. I can only say it takes whatever I throw at it. 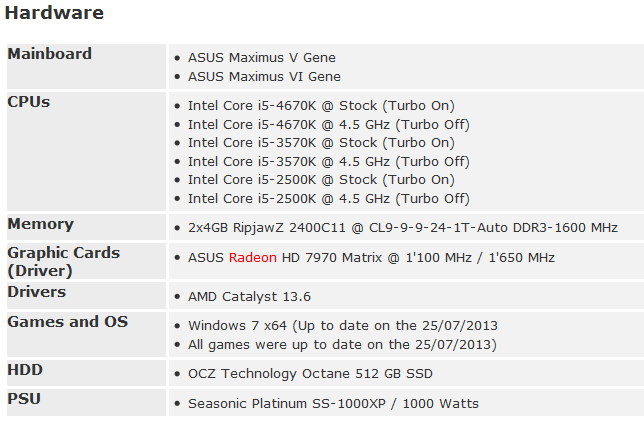 Also, I agree that those specs look awfully close for a 2500K at stock. At any rate, the OP should have an idea what he's getting for the price. He's saying he would be getting the 2500K and system for 350 "off a seller." He either means he's getting it for $350, or he's getting a $350 discount. It's not clear. But if someone were selling me a 2500K system with a decent-to-good motherboard, memory and whatever else, and I could feel confident that the processor hadn't been abused any more than my own 2600K overclock, that's a helluva price -- if that's the price . . . It really all depends on what "future-proof" means to you. I might have said it depends on whether you want a good computer for "less," or you have to have the latest and greatest for whatever it's going to cost. Also I think the graphics card is key to how much of the latter comes with the former. If there wasn't so much as an erratic fan-monitor on the motherboard in the $350 (or discount) bundle -- everything tip-top -- you could then spring for something like the ASUS Mars VGA card or a GeForce 780. Except for being a couple years behind on the mobo and processor (since the memory is good until DDR4 comes along and then some), you'd have a heck of a graphics card you could pass on into the next computer, I suppose . . .
at this point, when speed and price are a very good match and things seem to look right, i still look at the motherboard. 2 generations behind now in CPU architecture. 4th gen i5 and new mobo (bundle), can be had for a few dollars difference compared to older stuff people are getting rid of. suddenly, we're getting a new cpu, a new mobo and updated technology, regardless of speed. Well, you could take an i5-2500K and drop it into a Z77 motherboard, so . . . one generation? Those and the skt-2011 boards are still being sold -- the whole spectrum of prices and features. How many new instructions have been added to the IB and then Haswell instruction sets? How much computing power are you going to use at any given time? The trend is to reduce the lithography in nanometers, pack more transistors into a smaller package, reduce power consumption requirements. But the reduction in power requirements isn't compensating enough for cooling. They've pretty much edged up speed by increments -- the top-end "X" chip of the IB-E has a spec turbo speed of 4.0 Ghz. The odd thing about building your own machines is the attachment. IF you sell a machine, your original outlay less what a buyer paid for it secondhand would tell you your annual computing cost. Or you could dismantle a perfectly good system you use daily for various mainstream or oddball purposes, sell certain parts and re-use the others. Looking back, it seemed as though it took a lot longer to move from Pentium II to IV than it has going from SB to Haswell. I can't even keep up with the number of different chips they produce for any generation, when you throw in the mobile processors for laptops and . . . other . . . stuff . . The technology has outstripped the needs of many mainstream uses, other than gaming. We should be getting rid of the C2Ds we have here, because they're all past 5 years old. But with SSDs and other things, nobody is unhappy yet. I will build one machine this year. But I'll also have to retire one, or I won't be able to find a place to sit down . . . I'm also still rocking a 2500K mildly OCed to 4.2. I only really play BF4 at the moment, and I don't notice any drops in performance when playing. Haven't done any kind of CPU benchmarks, but subjectively the 2500K is perfectly adequate for modern games (except if they utilise HT). That being said, I'm almost certainly upgrading to the Broadwell-equivalent when it launches, hopefully before year-end. Well my first i5 was the 2500k, great chip. Did a lot of gaming with it, it powered my gtx 580 and did well. Then I grabbed a 3570k and a 7970 also great chip and while I don't think there was much difference between the two processors, I could definitely feel a difference, maybe it was my e-peen. I have a 4670 chip but have no been able to test it with anything decent yet so I cannot comment on it. Overall to me it seems like they all perform similarly. That being said, according to those charts, if the i5 2500k is with in 1 or 2 fps margin of difference from a 4670k then I think being able to grab one w/ mobo, ram, psu, case for $350, is definitely a bargain. I might grab it just to do some real world testing. 4670K = 1.1x 3570K = 1.13x 2500K. Even with terrible luck in the Haswell IHS lottery, you should be able to hit 4GHz = 4.52GHz 2500K, which is decently high by Sandybridge standards. Conclusion : Haswell will offer better performance when clocked b*alls-to-the-walls, but not by too much in Sandybridge terms (couple of 100MHz). Yes, the i5 2500k is still a solid performance chip. But is it really a bargain at $350.-? Is there an OS and HD coming with the system? The reason I ask is if it's bare bones $350- may not be that great of a deal..... Cheap mobo and nasty PSU/case could ruin the value. I told him to keep the HDD, because I have spares. Also, I have never had a problem with cheap mobos, I actually skimp on mobos when i build my systems. I am not an overclocker and I look for the pure basics when looking for a MOBO. If I can get a mobo that will hold my video card cpu and ram, and enough sata ports for what I need, and it comes in at 70 dollars, I am taking it. Thermaltake SMART 650W - ?? maybe $15-20?? Silverstone LC17S Black - ?? cases often cost more to ship than they are worth on the used market although this one is a nicer older case.... maybe $20-40.- ? Without an OS and a HD $350 seems steep to me. WOAH I have never seen prices like those. If used prices were like you mentioned I would be buying computers left right and center. The 2500k I agree is worth $150. Cooler is probably worth $15 at 50%. The mobo retains 50% value so $50-$60. DDR3 ram due to price increases is highly sought and usually retains retail value placing 4GB at $40. BLURAY drive is definitely not worth $0.... Its at least $30 used. Thats a total of $390, If you can get me a system with similar specs to this at $250, by all means grab me one I'll buy those all day and resell them for over $100 profit. Well, the Magic Monkey has a point. I buy all my automobiles "used:" the last time I bought a new one it was 1979. As analog, it's a much more serious purchase than a computer or computer parts. If you're good at "proofing" used cars, you still expect to spend some money on refurbishments -- perhaps less with lower mileage and age. As for motherboards, that's also true. You can buy a board for less than $100 -- maybe a sliver more -- and build a computer that may last for years. We bought two $95 mATX boards in 2008; one is still running fine; the other may well have done so, but we needed to get rid of it to suit the round-robin hand-me-down of a better machine in the house. I think I went to Goodwill Industries once to see if they would take a computer, and I thought they said "No." I'm not sure where you could donate an old system these days. LA Unified wants to give their kids I-Pads. Here at the forums, you can sell individual parts and there may be demand. Hey it's all about perceived value. Sounds like you really want to grab it JumBie and it's definitely a decent setup. I just wouldn't call it a "bargain". So a 2500k is still just as good as a 4670k for gaming? A 5%~10% increase is hardly worth upgrading, especially for those of us who game @ 1440p. From what I can gather, the answer is yes. I play games at 1080p and the figures earlier in the thread show < 5% difference at stock clocks. It's interesting to think of any different individual's "time-horizon," foresight and hindsight. There are several trade-offs subject to poor "estimation." These trade-offs may not exist if one is such an enthusiast with so much of a budget that you can entertain exchanging computers like picking a suit from the closet on whatever day or year "suits you." For instance, say I built my current "best" computer to last for . . howsoever many years it would last. I see this history of incremental chip-generation improvement. Think of it! The great milestones over the last decade: you'd pick the jump from Northwood/Prescott single cores to dual-core Pentium-D as a major shift. If you were upgrading from an old E6600 system you built in '06 or '07, your choices would be limited to IB or Haswell. Or -- AMD's offerings. In that case, the "trade-off" is not a contentious issue. And you would certainly live with the blessings you get. For me, I'm afraid that getting the full economic value from my system without building another will leave me to be a sort of technological Rip van Winkle -- that I'll wake up and suddenly see that I'm bewildered with technological progress. This has already added a third-dimension of the same anxiety: we're mostly "stay-at-home" types here, my cell-phone is six years old and pretty "dumb," and I still need to budget some money for an Ultrabook, a "Surface," a tablet . . . . whatever. . . There's no limit to it. In the 1950s, you'd only imagine spending money on a transistor radio or a new TV . . . .
Stock equivalent for 3570k @ 4.8?